Kuopio - On Tuesday we can expect cloudless weather. 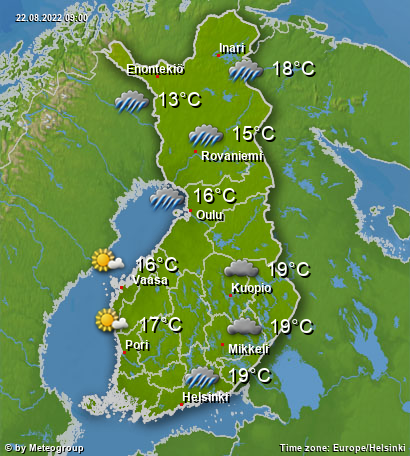 Sää Varoitukset Finland offers current weather data, local weather forecasts and more useful information about weather. With the help of our high-resolution weather radar and current severe weather warnings nasty surprises will belong to the past. The main factor influencing Finland’s climate is the country’s geographical position between the 60th and 70th northern parallels. Thus, it is among the northernmost countries of the world. Depending on the prevailing currents, the advected air masses are either of maritime or continental origin. From west and southwest the main influence comes from the Baltic Sea. In addition, foehn effects which occur on the leeward side of the Scandinavian Mountains represent an important orographic factor. When easterly winds prevail, continental air masses dominate the weather in Finland. Inland waterways account for most of the small-scale climate variability. According to the climate classification by Köppen and Geiger, Finland is assigned to cold moderate climates (class D). This class comprises regions which have an average temperature above 10 degrees in their warmest months, and a coldest month average below -3 degrees. The annual mean temperatures in Finland range from -1.9 degrees in Enontekiö in the far northwest to 6.5 degrees on the island of Utö, being the southernmost settlement of the country. The capital Helsinki has an average temperature of 5.9 degrees, thus, it is significantly cooler than in Berlin or Zurich with 10.2 and 9.4 degrees, respectively. Due to Finland’s flat topography, the spatial variaton of precipitation is relatively small. On average, the southwestern parts receive 700 to 750 l/m² of precipitation per year. Drier conditions are found in the coastal areas of the Gulf of Bothnia and in the north of Lapland with average amounts of 450 to 500 l/m². By comparison, the average annual precipitation amounts in Germany range from 483 l/m² (Grünow, Brandenburg) to 2340 l/m² (Oberstdorf, Bavaria)! Furthermore, there is no significant dry season in Finland. Winter and spring months account for about 40 percent of the annual precipitation. While spring is the driest season in most parts of the country, in Lapland, least precipitation is measured during winter. The remaining 60 percent of precipitation fall in equal shares during summer and autumn. In winter, the mean temperature remains below 0 degrees. Winter already starts around mid-October and lasts until the beginning of May in Lapland. In Åland it lasts 100 days and, thus, only about half as long. A major part of Lapland and about one third of the whole country lie north of the polar circle (66.56°). Here, a certain period of winter is known as “polar night”, when the sun does not rise above the horizon at all. The farther one moves north from the polar circle, the longer the polar night lasts. In the northernmost corner of Finland it remains dark for 51 days in a row, whereas, in the far south of the country the shortest day is about 6 hours long around winter solstice (Talvipäivänseisaus). Correspondingly, this results in a large variation in temperatures. In the north of Finland, in the provinces of Oulu and Lapland, January is the coldest month with average temperatures ranging from -14 to -12 degrees. In the southwest it is coldest in February. As long as the Gulf of Bothnia to the west and the Gulf of Finland to the south are ice-free, the warming effect of seawater is noticeable along the coastlines. On the island of Utö, the mean temperature in February is -2.2 degrees. From the middle to the end of October permanent snow covers Lapland. On the Åland islands, however, this is normally not the case until the beginning of January. Usually, snow depth reaches its maximum in March with 60 to 80 cm in the north and 1 to 10 cm on the coasts of the southwest. Here, snowmelt already starts in the beginning of April. In the north, most of the snow is gone around the end of May and the beginning of June and 7 months of winter are over. During summer, the mean temperature lies above 10 degrees. Summer usually lasts from the end of May until mid-September in the south of Finland. In Lapland it starts one month later and ends one month earlier than in the south. It is warmest in the month of July with an average temperature in Helsinki of 17.8 degrees. For comparison, the mean temperature in Munich is 18.3 degrees. In the north it is less warm with average July temperatures from 11.2 (Enontekiö) to 14.0 degrees (Inari). Highs inland may reach 32 to 35 degrees, on the coasts, however, highs exceeding 30 degrees are extremely rare. The hottest day on record was 29 July 2010, when temperatures exceeded 35 degrees in many places and 37.2 degrees were recorded in Joensuu. Temperatures exceed 25 degrees on 10 to 15 days per summer inland in the middle and the south of Finland, and on 5 to 10 days in the north and on the coast. During the period called “midnight sun” the sun remains visible 24 hours a day. At the polar circle this happens one day per year on 21 June. However, in the municipality of Utsjoki, in the far north of the country, midnight sun lasts from 20 May to 21 July. The longest day in the southwest of Finland is nearly 19 hours long around midsummer (Kesäpäivänseisaus).